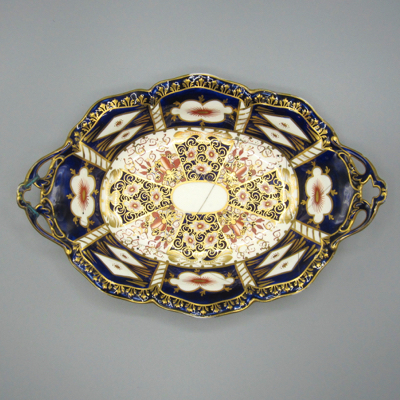 This porcelain serving dish was made in England by Royal Crown Derby in 1905. 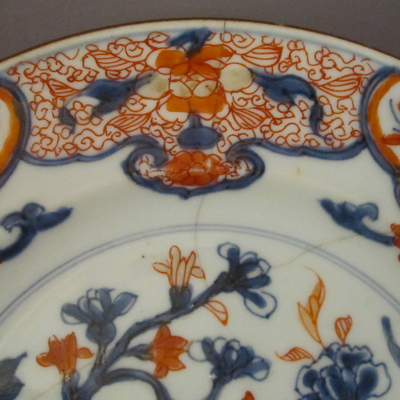 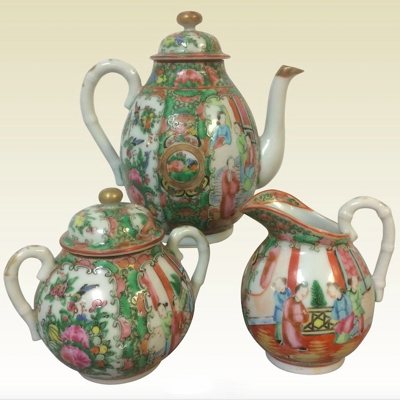 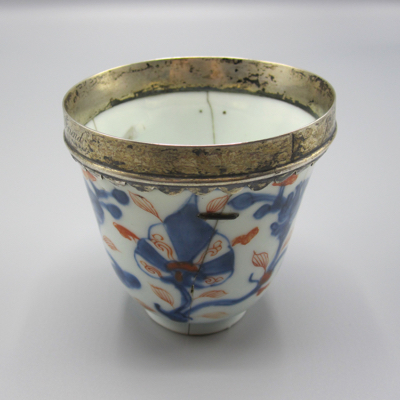 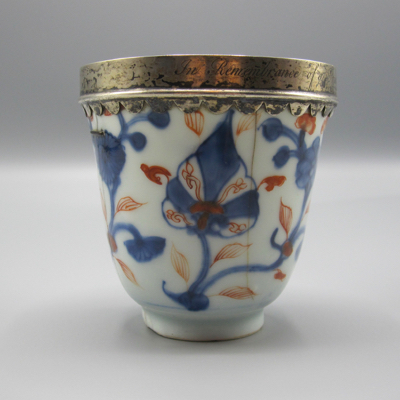 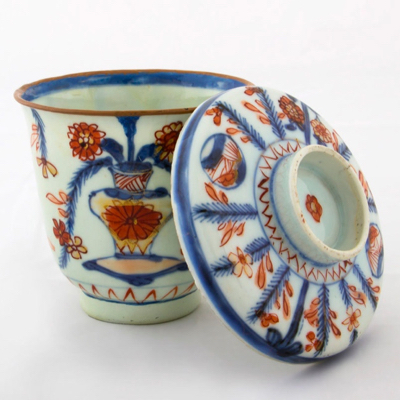 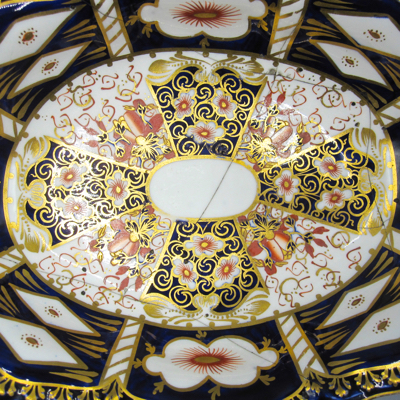 It is hand painted in the Imari palette of cobalt blue, iron red, and gilt. 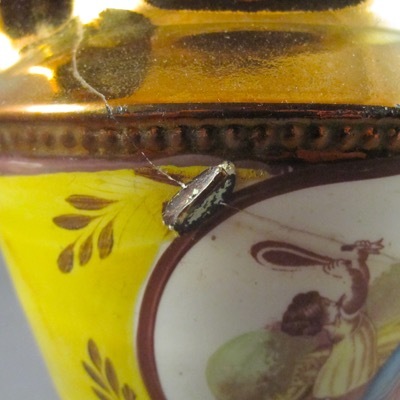 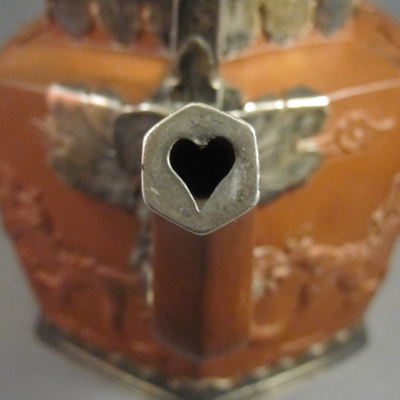 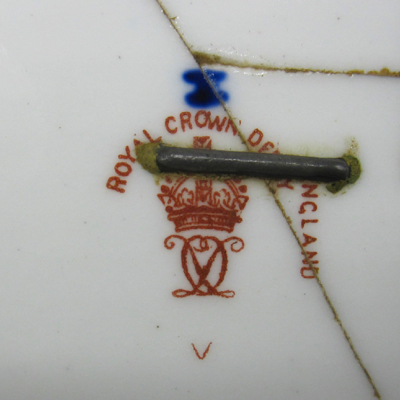 On the underside is a red printed mark ROYAL CROWN DERBY, ENGLAND with cypher and an incised mark DERBY, 7-04, dating it to 1905. 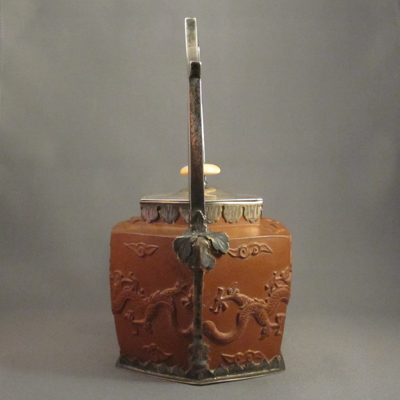 It measures 10 inches by 7 inches and is 1.75 inches high. 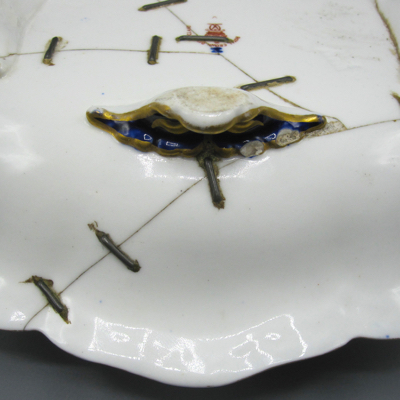 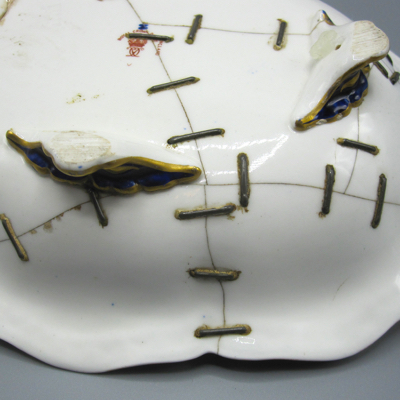 Although two painted metal staples on top of one of the handles hint at what is hiding below deck, it isn’t until this pretty dish is flipped over that things gets more interesting. 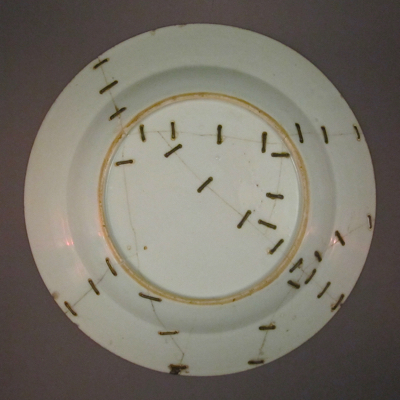 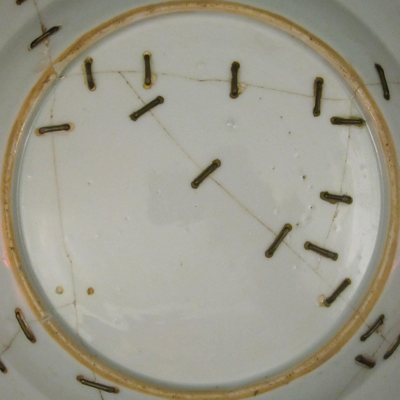 After this dish fell to the floor and shattered into 9 pieces, it was taken to a china mender, who made it whole again by drilling 68 tiny holes and adding 34 metal staples. 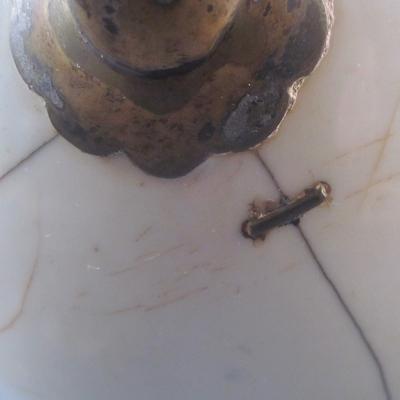 Typically china menders charged per staple, so this repair job must have cost the owner a pretty penny. 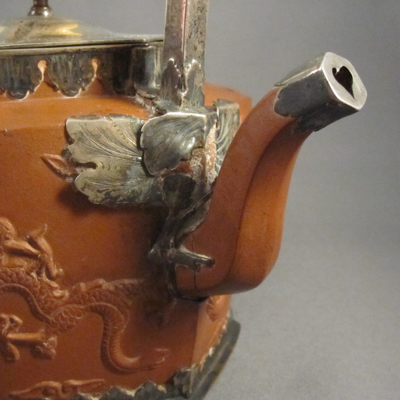 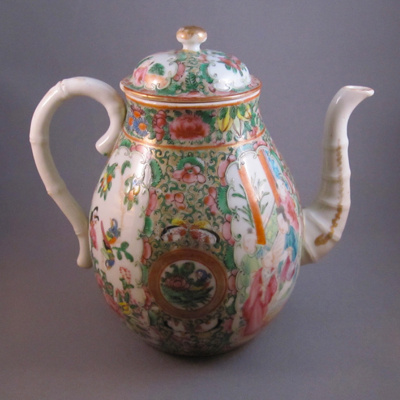 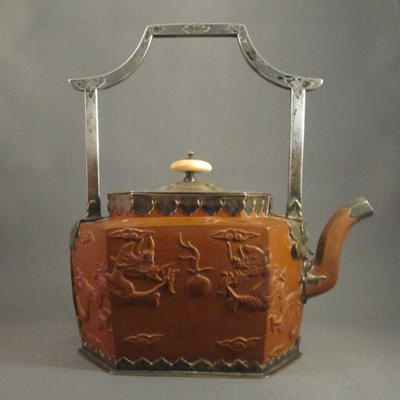 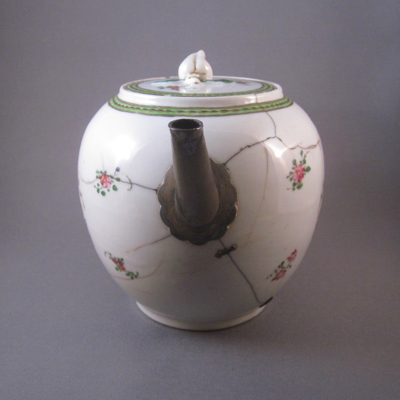 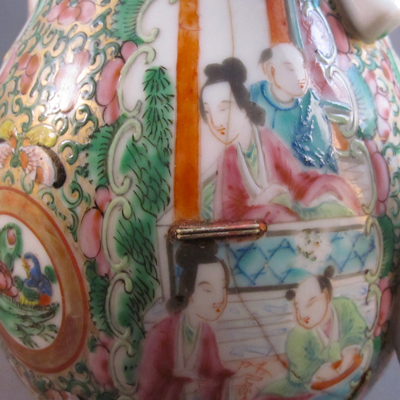 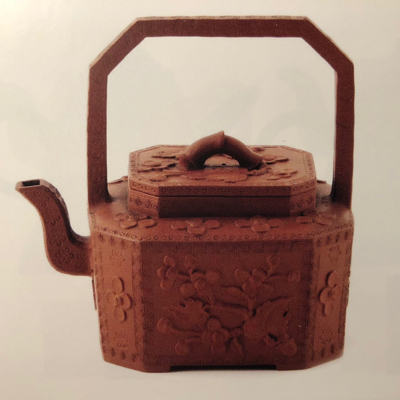 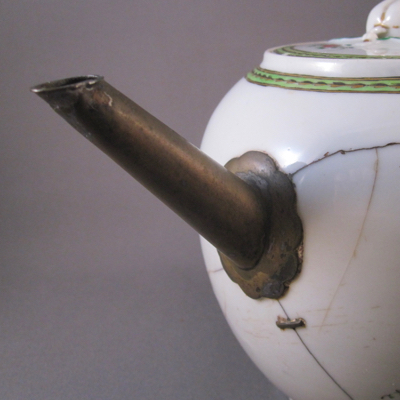 This bulbous form porcelain coffee pot was made in China during the Qing dynasty, circa 1850-1890. 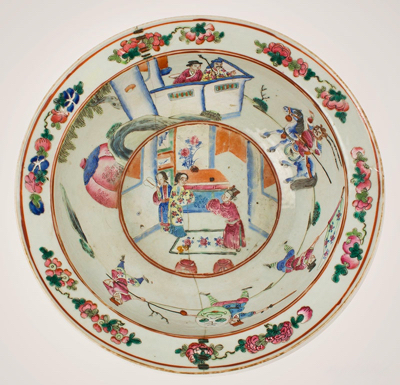 It is decorated with figures, birds, butterflies and flowers in the Rose Medallion palette, including green, pink, yellow, blue, black and gold enamels. 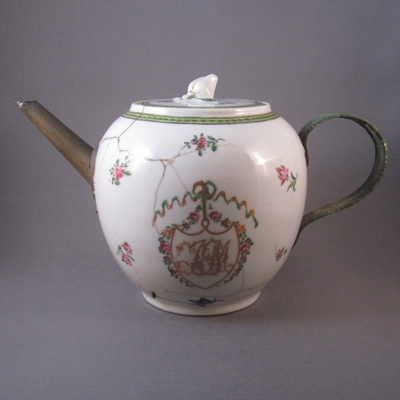 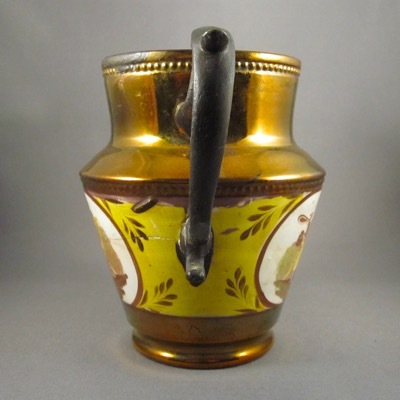 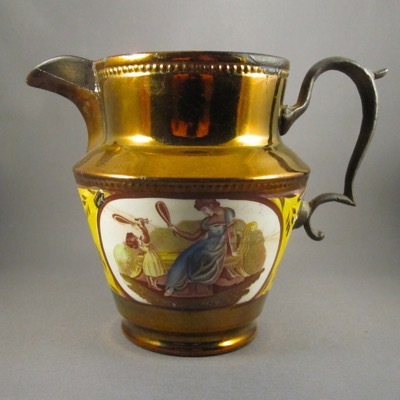 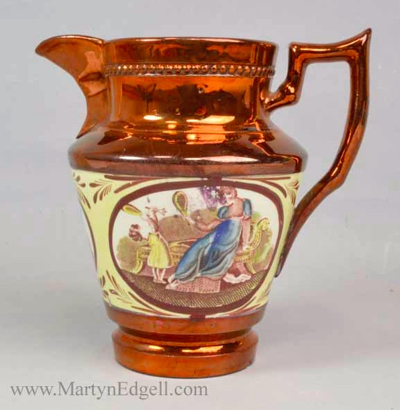 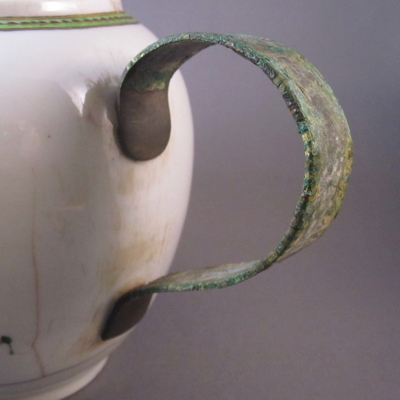 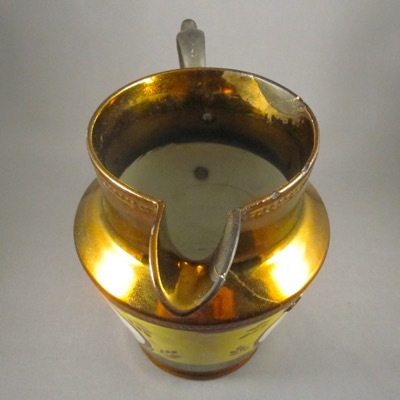 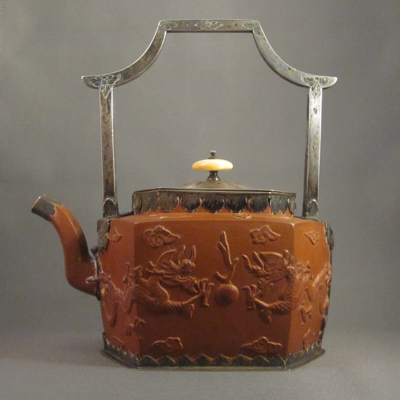 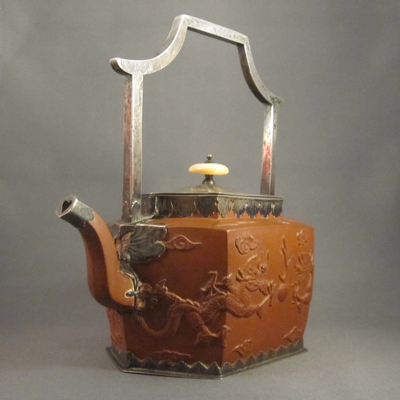 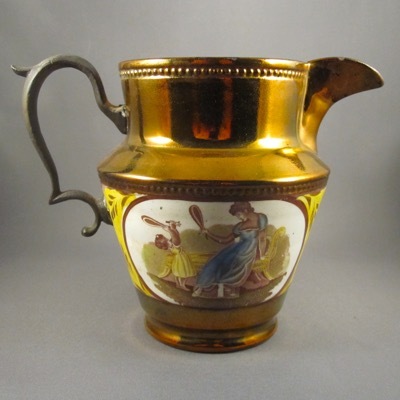 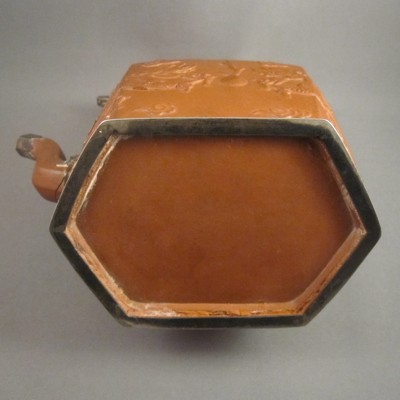 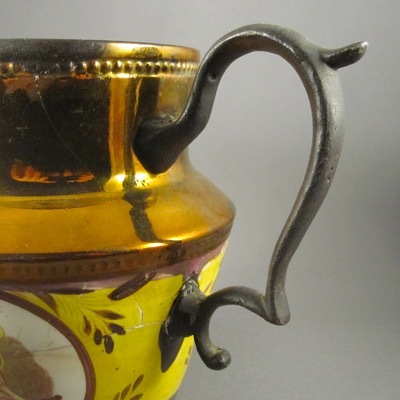 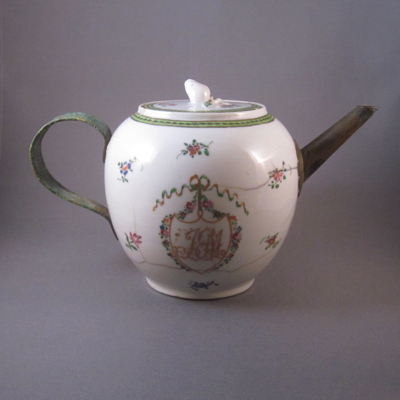 It measures 7.25 inches high and 8 inches wide from handle to spout. 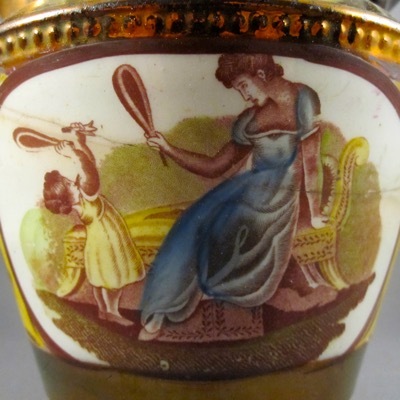 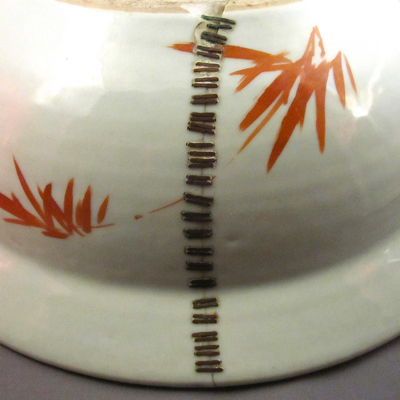 At first glance you may wonder why this seemingly “perfect” pot has made its way into my collection. 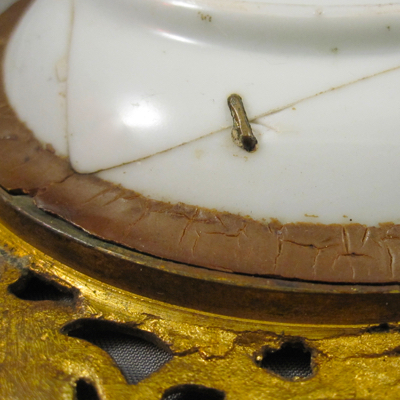 But look closely and you will find a couple of large cracks on the the sides, held tightly together with the aid of 3 large metal grooved staples. 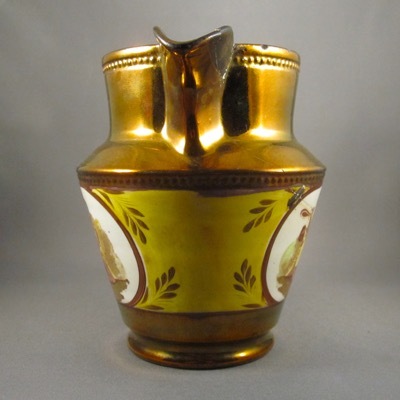 It is neither exceptional nor rare, but I like it because it has kept its dignity intact after surviving a tumble well over 100 years ago. 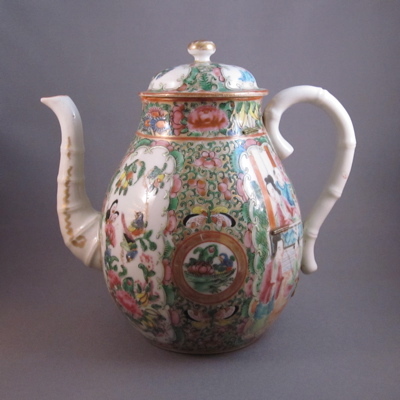 Here’s a similar coffee pot, along with a matching sugar bowl and creamer. 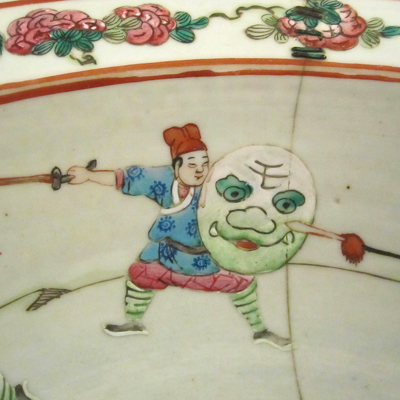 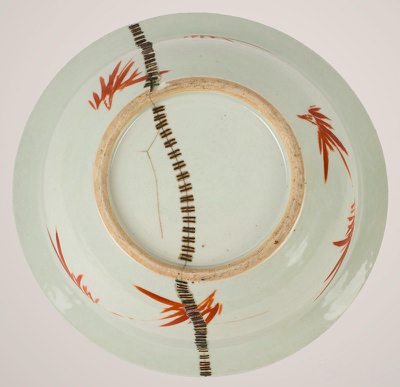 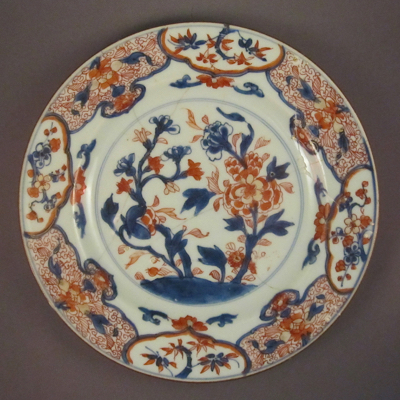 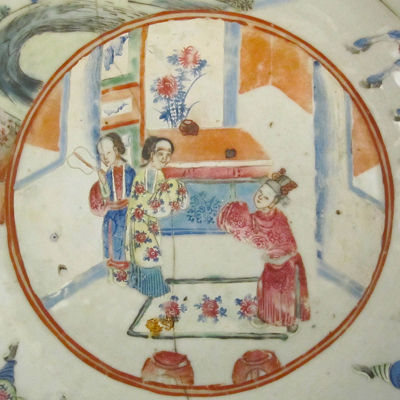 This porcelain plate was made in China during the Qianlong period (1736-95) and measures nearly 9 inches in diameter. 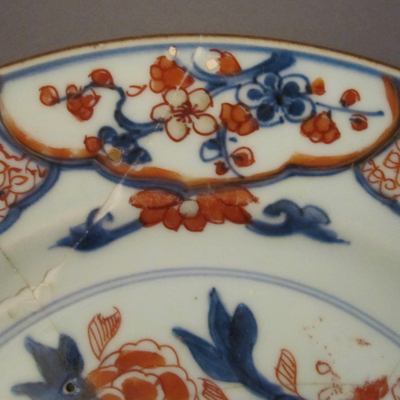 It has a central motif of branches and flowers in the Japanese Imari palette of cobalt blue underglaze with red and gold overglaze washes. 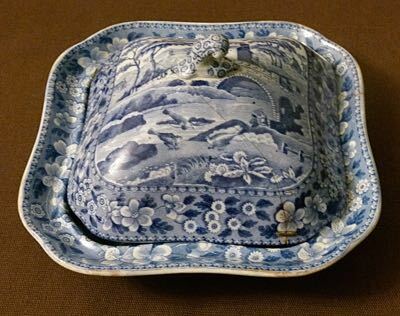 A fine plate, in my humble opinion, but not an extraordinary example by any means. 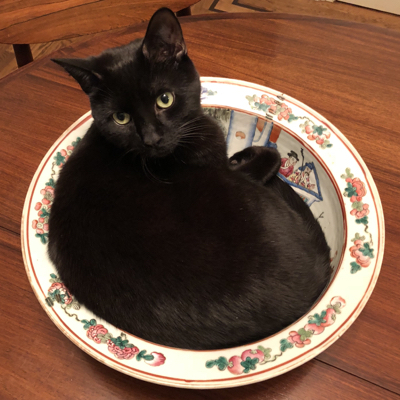 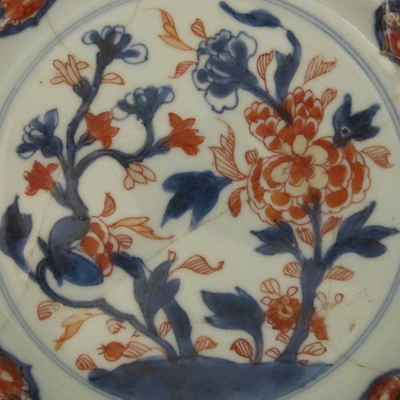 But…when the plate is turned over, the true beauty and the reason that I purchased it for my collection, is revealed. 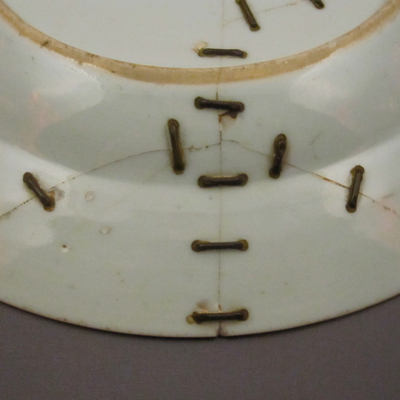 34 small brass staples, seen only on the underside, clamp together the 8 broken pieces as tight as when the repair was done, over 200 years ago. 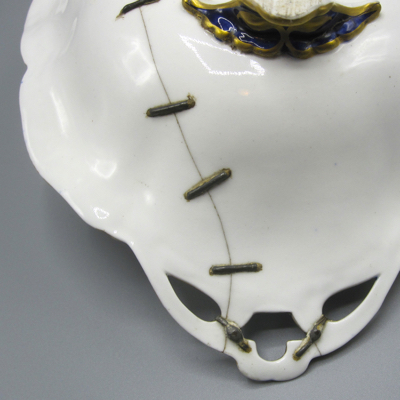 Even though stapling, aka riveting, is the most common form of inventive repair, I still marvel at examples such as this. 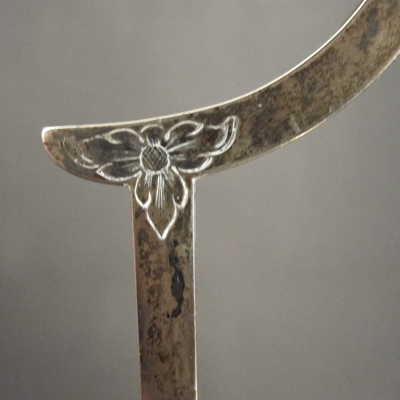 And naturally, I would proudly display it with the “wrong” side out. 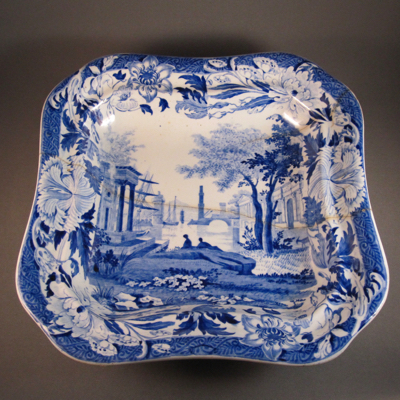 This serving dish was made in England by Wedgwood, c.1830. 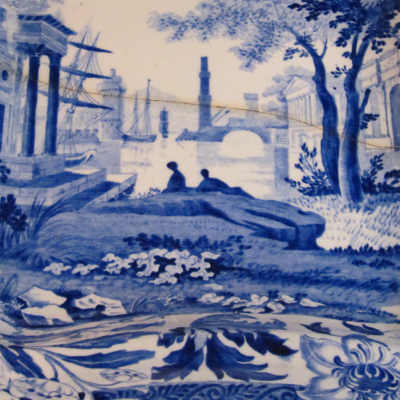 It is decorated with a blue transfer scene depicting buildings, ships, trees, and overscaled flowers along the border. 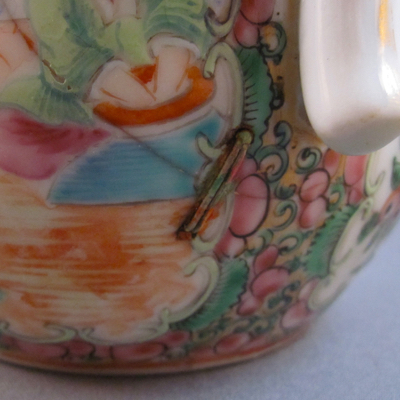 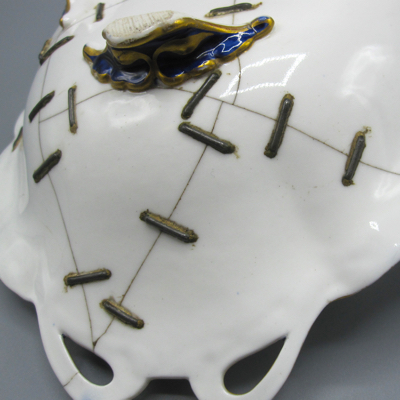 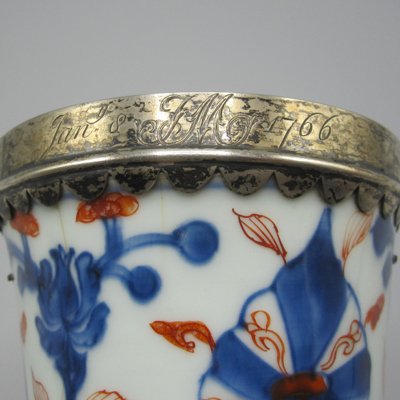 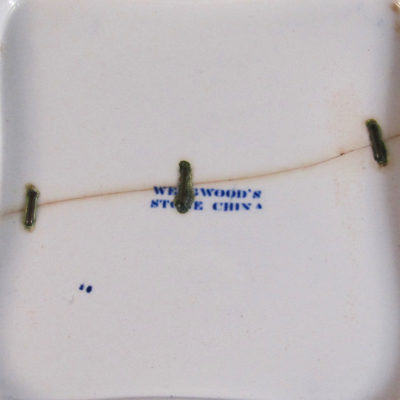 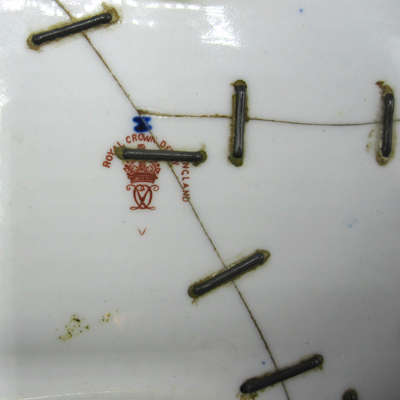 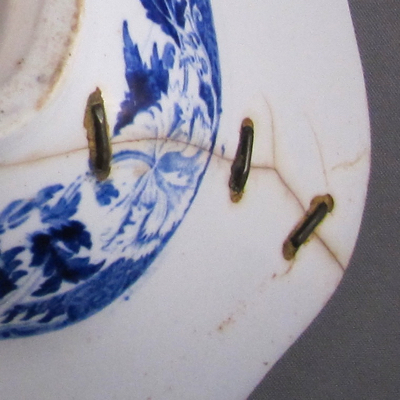 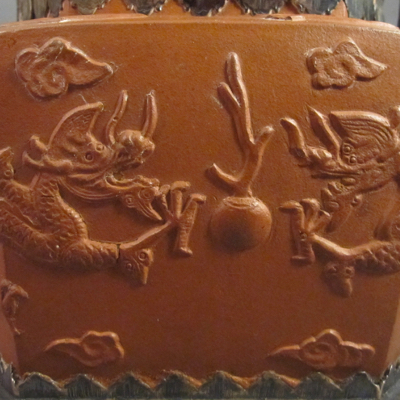 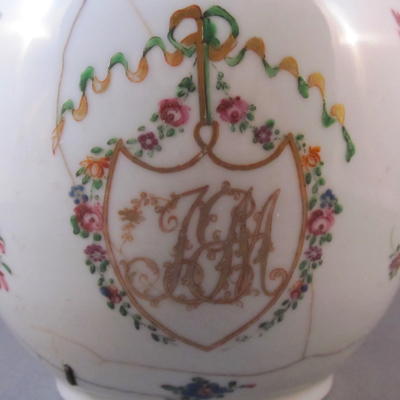 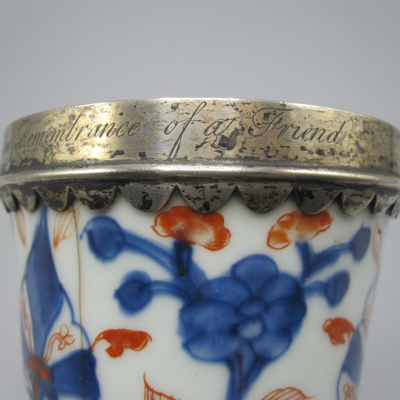 On the underside is the stamped mark “WEDGWOOD’S STONE CHINA”. 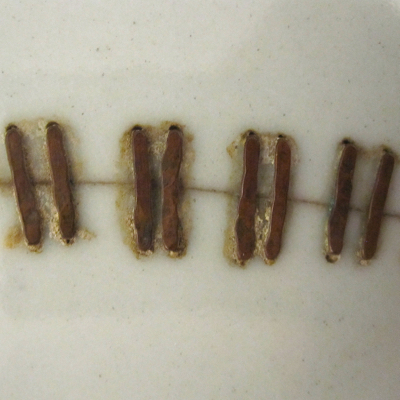 It measures 9 inches square. 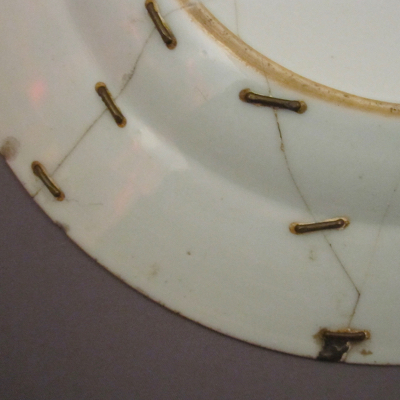 Well over 100 years ago when this dish broke in half, it was brought to a “china mender” who repaired it using 12 metal staples, aka rivets. 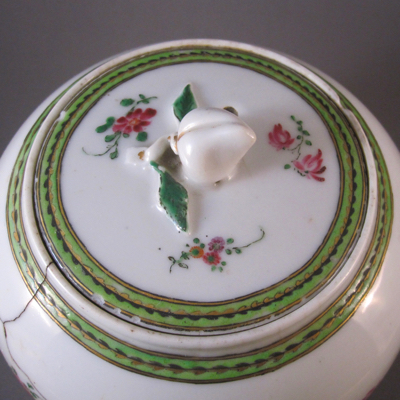 Originally it had a cover but I am guessing that when it took a tumble the lid was broken beyond repair. 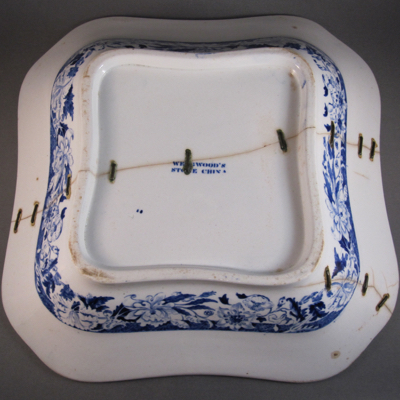 But at least the more functional piece survived and thanks to the handiwork of a 19th century restorer, this dish can still be used today. 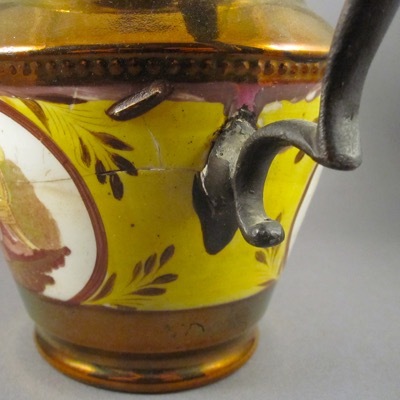 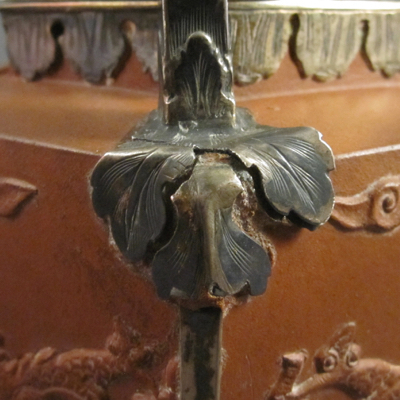 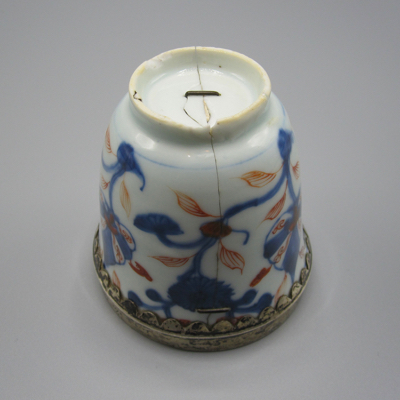 This covered dish of similar form and decoration still has its original cover. 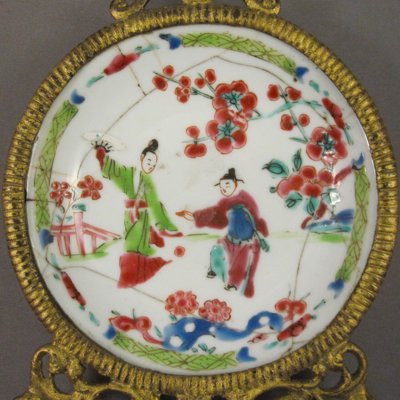 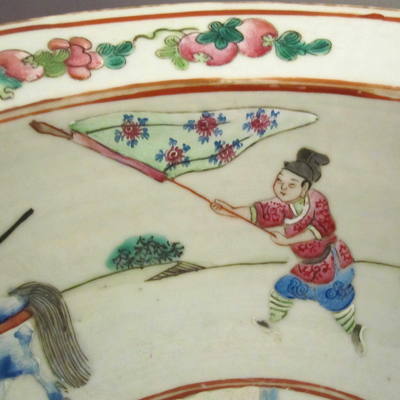 This porcelain dish was made in China for export to Europe in the middle 1700s. 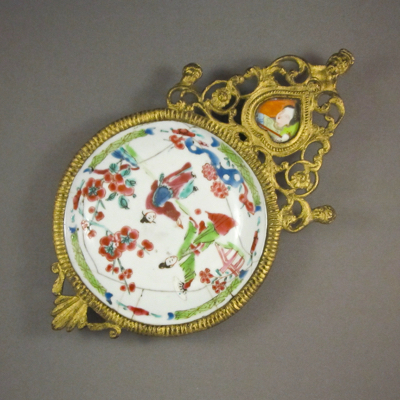 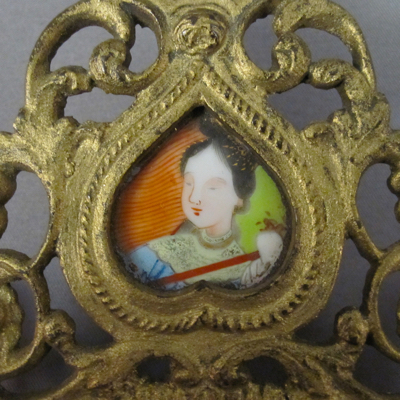 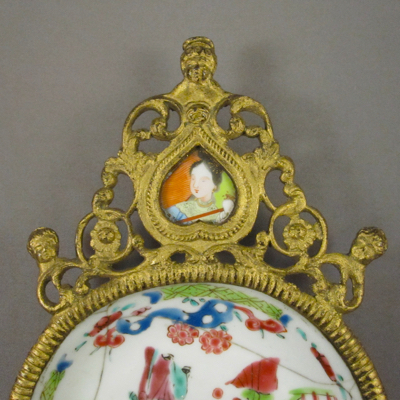 It is decorated with figures in blue, red, green, and black enamels and measures 8 inches long, including the mount, with a diameter of 4.25 inches. 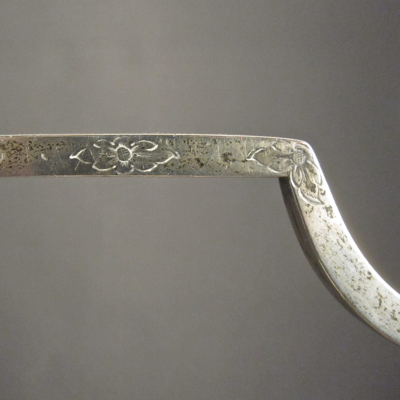 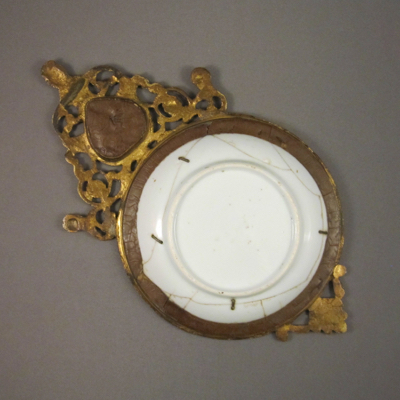 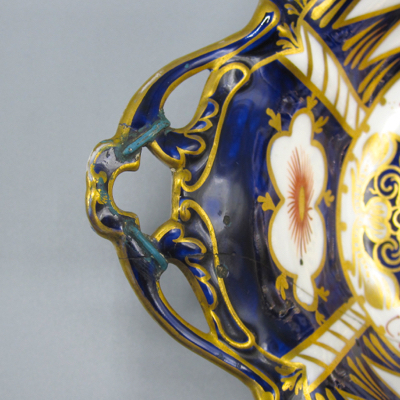 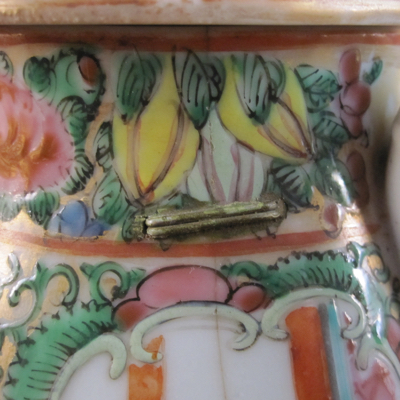 Not only was this dish repaired on the underside using 4 metal staples, each .25 inches long, but a fragment from another piece was added to the ornate bronze rococo mount. 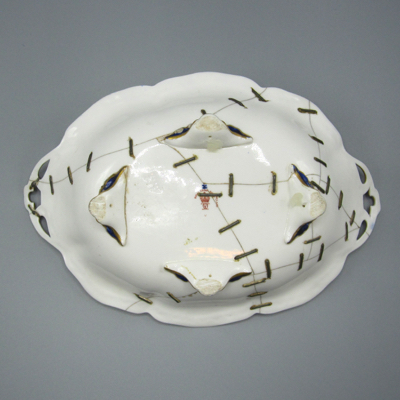 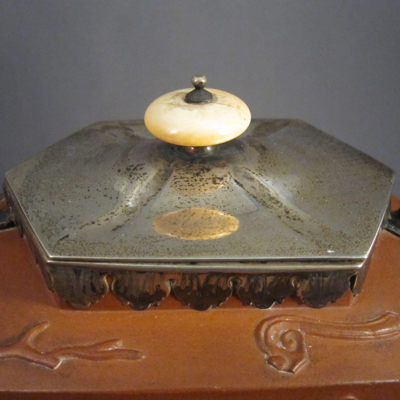 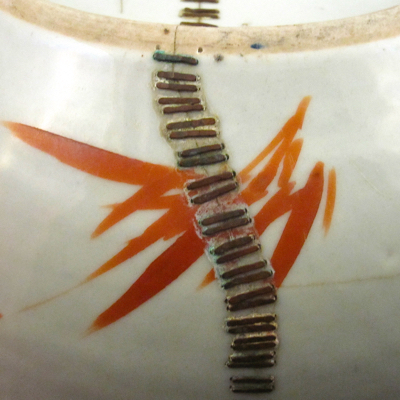 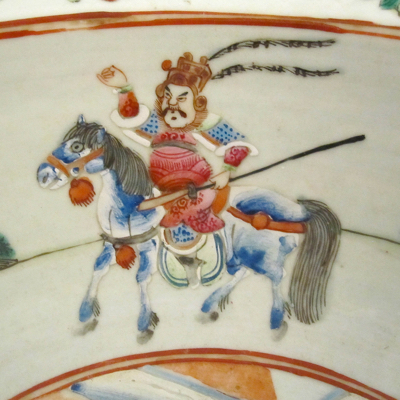 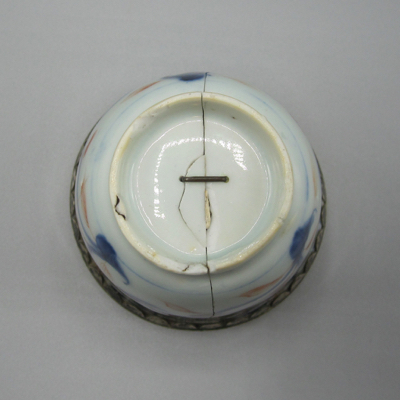 Please take a look at an earlier post with a similar porcelain dish and bronze mount: Kanji period dish, c.1700.